Below are some samples of quiz questions illustrating how they would appear in slides within a questions slideshow. The slides will be full screen size when the slideshow is played. Try answering these questions. Scroll down this page to see the answers and how these would appear in the answers slideshow. The answers to questions always appear in the answers slideshow with the correct answer underlined in each slide. The slides will be full screen size when the slideshow is played. Did you get the answers to any of the questions right? Samples of the additional information that the quizmaster has the option to use, in full or in part, when presenting the quiz answers slideshow can be found below. This information relates to the quiz answers slides shown above. The tulip became very popular in Ottoman territories where it was first cultivated and was seen as a symbol of abundance and indulgence. In fact, the era during which the Ottoman Empire was wealthiest is often called the Tulip era or Lale Devri in Turkish. Tulips are planted at least twice the bulb’s width apart and to a depth of two or three times the bulb’s height. They prefer a soil that is neutral to alkaline. The genus Tulipa comprises 109 species and belongs to the family Liliaceae. Kohl rabi, otherwise known as the German turnip, is a cultivar of the cabbage that will grow almost anywhere. The taste and texture of kohl rabi are similar to those of a broccoli stem or cabbage heart, but milder and sweeter, with a higher ratio of flesh to skin. 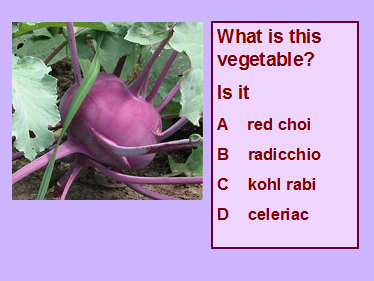 Kohl rabi can be eaten raw as well as cooked. A fast growing vegetable, kohl rabi matures within 60 days of seed being sown. The tayberry was patented in 1979 as a cross between a blackberry and a red raspberry. Tayberries should be ready to harvest in early July, depending on the type. Frost is rarely a problem, as tayberries flower late in the season. Tayberries are very soft when fully ripe, so they cannot be harvested by machine and are not a commercially viable soft fruit. Producing heavier crops than a loganberry, the tayberry is excellent for cooking, freezing and jam making. 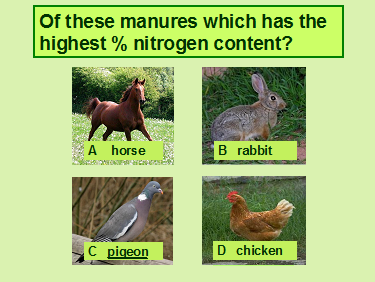 Horse manure is 0.7% nitrogen, Rabbit manure is 2.4% nitrogen, Pigeon manure is 5.0% nitrogen, Chicken manure is 1.5% nitrogen. Pigeon manure is generally too strong to use directly on the garden but it does make an excellent activator for a compost heap. The only plant that you can apply pigeon manure to directly is comfrey. Pigeons are highly intelligent and can recognise all 26 letters of the alphabet.